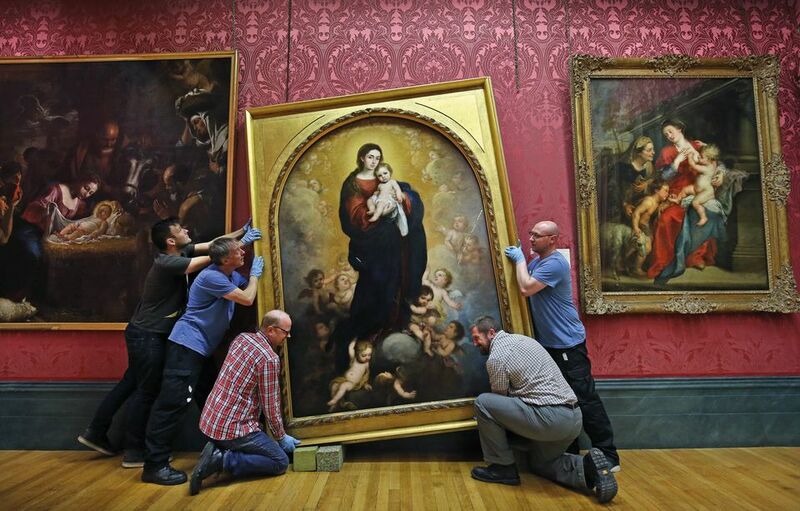 A large altarpiece by the 17th-century Spanish master Bartolomé Esteban Murillo is back on display at the Walker Art Gallery in Liverpool after a major conservation treatment—the first in more than 150 years. Conservators from National Museums Liverpool inpainted areas of loss and successfully removed layers of discoloured varnish from Virgin and Child in Glory (1673), revealing the “exquisite painterly skills for which Murillo is renowned”, says Xanthe Brooke, the museum’s curator of European art. Paint analysis determined that the blue pigment used to depict the Virgin’s robe is ultramarine—an expensive pigment made from lapis lazuli—and infrared reflectography showed changes that Murillo made to the composition. “It’s been fascinating to discover how the artist revised his composition on the canvas, making improvements and experimenting with new ideas as he worked,” Brooke says. The archbishop of Seville, Ambrosio Ignacio Spínola y Guzmán, commissioned the altarpiece for his private chapel. The central panel depicting the Virgin and Child was removed from the altarpiece in the late 18th century and a copy of the scene inserted in its place. The British banker and politician Lord Overstone was responsible for reuniting the original components of the altarpiece in the 19th century. Part of the treatment, paid for by the Art Fund charity, involved minimising the appearance of the line where the central scene was cut from the altarpiece. The Walker is showing Murillo’s modello of the Virgin and Child alongside the finished work, which was installed earlier this month.